can talk and laugh and share our week. I think it's important to spend quality time with the ones you love. night with a good friend or your kids, parents or maybe your furry friend. busy week. Have a great weekend! date night so you will be with us too. Looks like you are definitely ready to enjoy ... love the nail polish. Is Bentley going to get fluffed, also? Great idea! Sometimes the best date nights are when we wait for the kids to go to sleep and we have a nice romantic dinner just the two of us, at home! Nice and relaxing. Enjoy! How delightful, your evening is planned so lovely and I know it will be great. Beautiful linnens too. 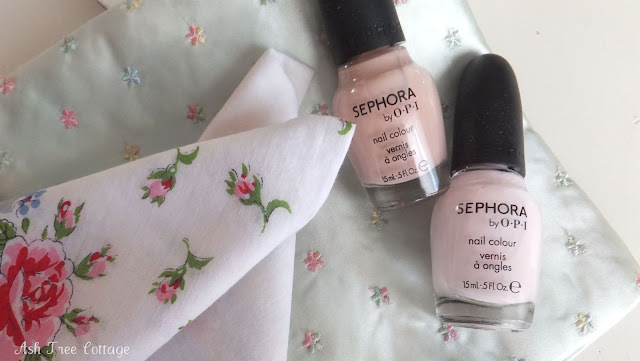 Pretty nail polish! 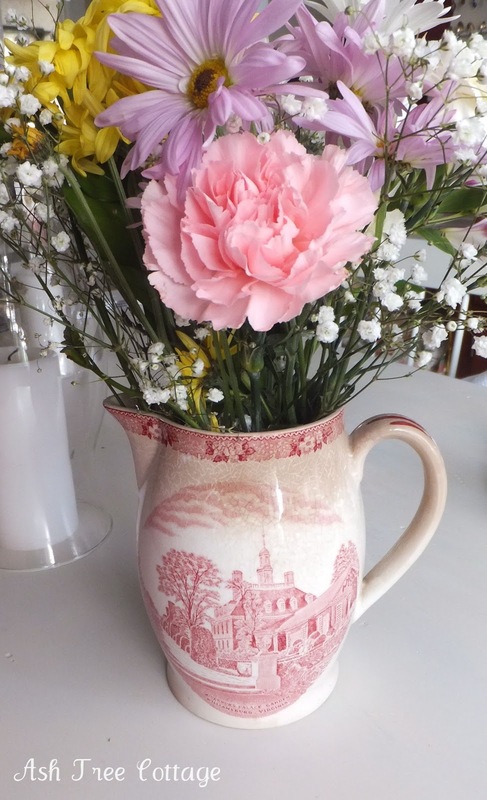 LOVE the transferware pitcher! Thanks for sharing and enjoy your date night. Happy Pinks! Date night! What I would give for a date night with my hubby! Seems like every weekend is consumed with the grandsons. I love them but every weekend gets old! Happy Pink Saturday. Awww - such a smart idea! My husband is now safe in heaven, but when he was here, we strived for at least one day a week - if not more. Even something as simple as wandering through a book store together. Such sweet family memories! Have a blessed time! I believe you have things in order for a very special evening. What a lovely romantic evening. A perfect night awaits. Enjoy! Have a great time on your date. 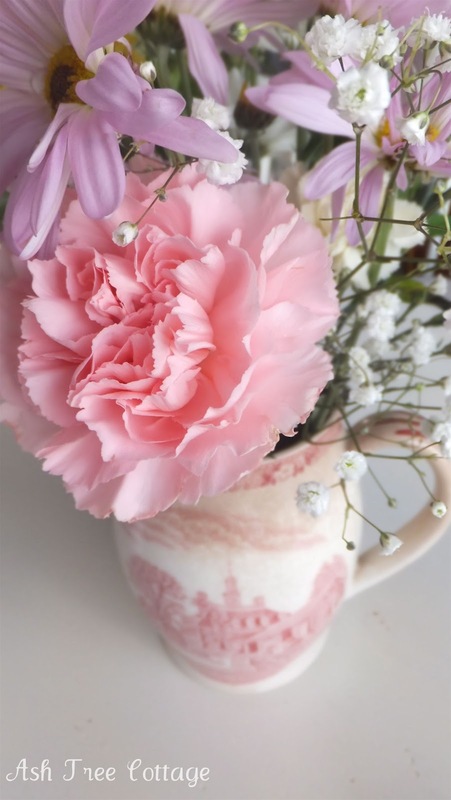 Do you know that I have the same little pink, yellow and blue flowers you are displaying next to the hankies? Of course, you do :) Bentley, who's lap will you be snuggling on, Momma's or Daddy's? Oh, I hope you have a wonderful evening with hubby. That's very sweet of you to make yourself so pretty for him. I love the teapot on your previous post. Gorgeous piece. 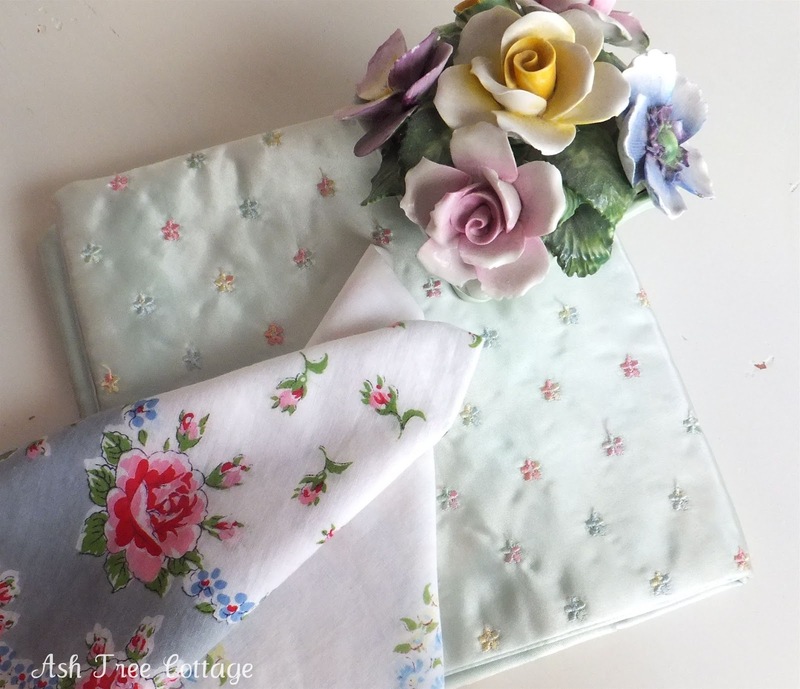 Have a wonderful time tonight....Lovin' the dainty little hankies. Enjoy. Those kind of nights are so important. Wonderful! Date nights are a must! 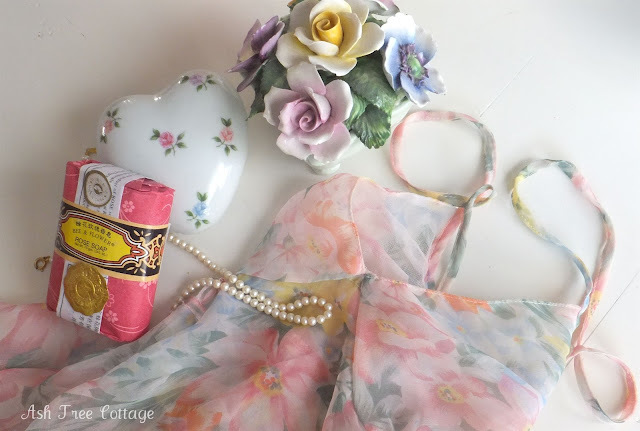 Love the pitcher, chemise, Staffordshire posy and hankies! Have a wonderful time! How fun!! I hope your date night was great. Sounds like a wonderful evening! Your hankies are so pretty and you can never go wrong with pink polish! Lovely idea,I hope you have a wonderful time. Your blog music matches the event beautifully. My style of music. It's so important to nurture our relationships with special evenings or afternoons - to take time to pamper oneself in whatever way is meaningful - I love it! What a lovely evening you have planned. I hope your hubby enjoyed it! Have a wonderful date night and I Love your red transferware pitcher!! Susan, I love the preps for your date night. Bentley is probably jealous. BIG smile here. Date night is a big deal with us. We plan dinner and a movie most weeks, just like we did before we married. Thanks for sharing you evening. VavavaBOOM- that was some attire there in the photo! Enjoy yourselves!